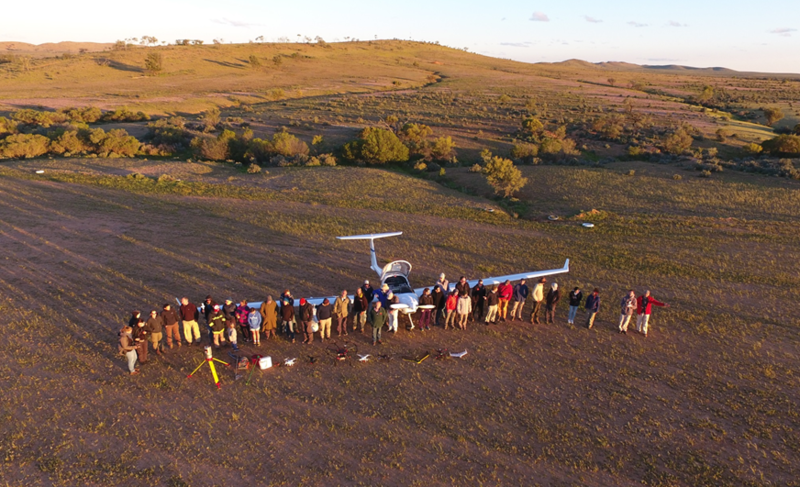 Staff group photo in front of a light aircraft. Our mission is to be a leader in research into environmental change, with global impact on real-world problems and its communication to the community. Our aim is to attract top quality young scientists and form collaborative partnerships with government, industry and the community. The Centre for Ecosystem Science is a unique unit within UNSW, with excellent researchers in ecosystem science and a diverse range of scientific expertise in terrestrial ecology (arid zones, forests, wetlands, marine ecosystems, GIS (geographic information systems), remote sensing and the use of conservation tools. We are within and strongly supported by the School of Biological, Earth and Environmental Science and the Science Faculty. Fowlers Gap Research Station is within the Centre for Ecosystem Science. The Centre for Ecosystem Science commits to increasingly develop our standing, through world-leading science, relevant to key issues of conservation and management. We publish in peer-reviewed journals, provide support to governments, including submissions on key policy and management issues relevant to the environment. We support our work by successfully attracting small to large grants from governments, including the Australian Research Council, industry and non-government organisations. We focus on public good research of value to decision-making by communities and governments. High profile projects include ecosystem restoration, sustainable aquaculture, waterbird surveys, reintroductions of locally extinct mammals, remote sensing, environmental flow management and the global Red-listing of Ecosystems. We have strong collaborations with scientists within the School of Biological, Earth and Environmental Sciences, other faculties, other Universities and outside organisations. The Centre for Ecosystem Science also actively collaborates with government and non-government scientists in research. We inspire young scientists within undergraduate courses through interesting and challenging experiences, including field courses. We have strong cohorts of postgraduate students. We aim to create a supportive environment for training our future environmental scientists so they can make an impact on environmental decisions. The Centre for Ecosystem Science can build our capacity for this work, by increasing the number of high-quality staff, numbers of research grant applications, students (undergraduate and postgraduate), number of publications in high-quality journals and productive partnerships. We are committed to increasing diversity in our workplace, ensuring opportunities for career development and improvement of skills among academics, postdoctoral scientists, students and other collaborators. We aim to become the premier research for ecosystem management in Australia. To be recognised as a world leader in at least three areas of environmental research including: Red-listing of ecosystems, restoration of terrestrial environments and management of freshwater ecosystems. To produce high-level research impact, in relation to the environment (i.e. policy and management), by maintaining, developing, and recruiting high calibre researchers. To develop stimulating educational experiences in environmental sciences, including unique field experiences (e.g. Advanced Field Biology, the Macquarie Marshes and Botswana). To deliver new opportunities, training, and skills development that equip our graduates well in environmental science, relevant to future employees. To encourage and support equal opportunities for staff and students and recognise diversity of background and contribution among undergraduates, graduates, postdoctoral, administrative, research and academic staff. To actively engage with organisations, initiatives and inform debate on issues representing grand environmental challenges for the world. To ensure wise and sustainable use of natural and human-impacted environments, which avoid long-term ecological and economic costs and recognise ecosystem values (intrinsic and services). To make our teaching internationally relevant, distinctive, innovative, stimulating and at the forefront of scientific knowledge, essential for environmental decision-making. To increase our state, national and global collaborations, joint funding and publications with partner institutions including government, industry, and non-government organisations. To develop initiatives and contributions, assisting disadvantaged and marginalised communities in the sustainable use of the environment.